Angela Mia De La Vega stands in her Lakewood art studio holding a small lump of brown clay in her hands. She is immediately taken back to her childhood where she would spend afternoons pulling bits of red Pennsylvania clay from her front yard, using it to craft tiny animal figurines. These moments were just a taste of her future career as a renowned sculptor. But even beyond beautiful works of art, Angela is leading a movement of artists who are making an impact. Angela Mia De La Vega in her backyard studio space. As an undergraduate student at Clarion University, Angela studied fine art and was encouraged toward creating abstract forms, and heard the same after traveling to Spain to study at the University of Madrid. But Angela’s heart was still drawn to creating detailed figures of people and animals. “The day I went back to sculpt something realistic, I felt so connected - like it was something that could come to life,” Angela said. 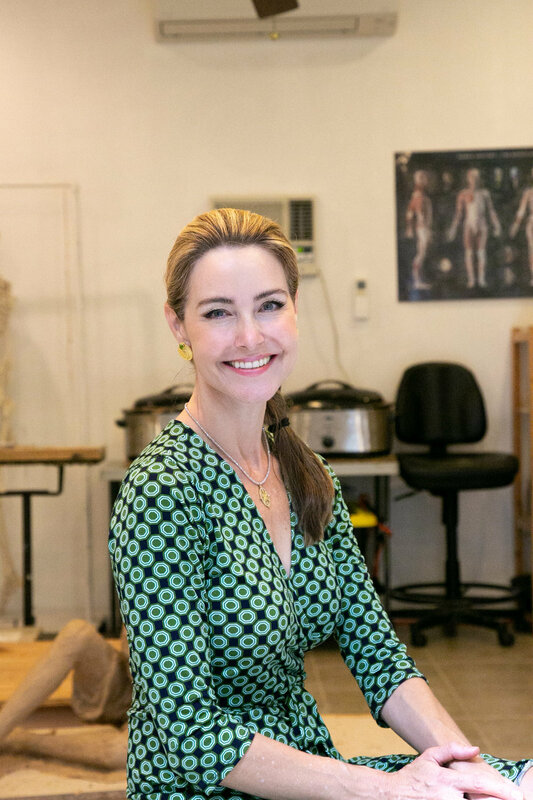 From that point on, Angela devoted her artistic career to creating pieces inspired by their real life counterparts, sculpting art for galleries around the world, as well as corporate and private commissions. But one sculpture in particular shifted Angela’s trajectory. “One night I was about to fall asleep and I had a vision of a little girl flying through the air surrounded by butterflies. And I sat up in bed and said out loud, ‘Lift her with butterflies!’” Angela shared. She was hungry to give back to her community after friends had supported her through a personal crisis, and suddenly a sculpture seemed like the clear way to make a tangible difference. Angela shaped the image of a girl being lifted by a swirl of butterflies just as she had dreamed, using her standard process of oil based clay surrounded by a silicone mold. The mold is then sent to a foundry that creates a hollow bronze casting using a lost-wax method. Once completed, Angela named the new piece “Lift Her With Butterflies” and began dreaming of artists joining together to empower people who had been affected by abuse, trafficking, and social exclusion. Angela demonstrates her measuring technique for creating half and two-third size sculptures of her models. Angela with the half-life size of "Lift Her With Butterflies" in her home. The "Lift Her With Butterflies" sculpture has been made into 45 full-size castings, 37 of which have already been sold, with proceeds given to FLITE's nonprofit partners. But the sculpture is far more than simply a fundraising tool. "People never ask me why I made it, but the love I poured in always comes through and connects with their story," Angela shared. One family purchased "Lift Her With Butterflies" in honor of their daughter, Katie, who lost her fight with childhood cancer, and donated the artwork to the children's hospital that cared for Katie during her illness. "I am in awe of the beautiful bridges of humanity that are created between myself and the recipient of my artwork," said Angela. This year’s event, The Art of Freedom, takes place on September 22nd at the Lawley Art Group Gallery in Dallas. Artists of all ages and backgrounds will feature their work, highlighted by talented local musicians - everyone giving a piece of their creativity in honor of those who are not yet free from abusive situations. Local painter, Tanner Lawley will also be creating a brand new piece in real time during the event, which will be sold to benefit FLITE. With a little clay and bronze, a camera, or a rainbow of paints, these artists are uplifting those who don’t yet have their butterflies. You can learn more about FLITE to Freedom and purchase tickets to The Art of Freedom event at their website.